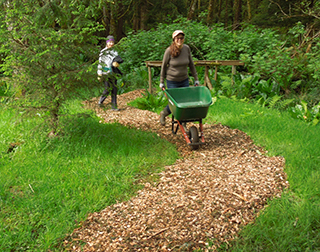 Help us tidy the trails at Circle Creek Conservation Center, getting them ready for the summer hiking season and for The Forest Remembers. We’ll be brushing out and mulching the Wetlands Walk and the Legacy Loop and repairing anything disturbed by winter flooding. Contact Stewardship Director Melissa Reich at melissar@nclctrust.org in advance for directions to the property and to let her know you’re coming. Bring a lunch and prepare to get muddy. There are no toilets on the property. Please leave your dog at home; dogs are not allowed on NCLC habitat reserves.